After Smithson’s nephew died in 1835, the United States was notified of this bequest. 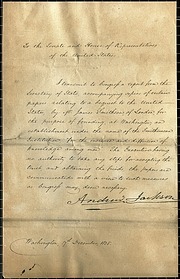 President Andrew Jackson asked the US Congress for authorization to pursue the bequest, sparking a controversy between federalists and advocates of states' rights. Senators John C. Calhoun and William Campbell Preston argued that there was no constitutional authority to create a national institution. However, led by John Quincy Adams, the federalists prevailed, and in 1836, Richard Rush traveled to England to file a claim for the Smithson estate in the British Court of Chancery, then eight hundred cases in arrears. In just two years, Rush won a judgment for the United States, disposed of Smithson's properties, and converted the proceeds to gold sovereigns. When the estate was delivered to the US Mint in Philadelphia in September 1838, it totaled $508,318.46. Another decade of debate passed, however, before the Smithsonian was actually established. 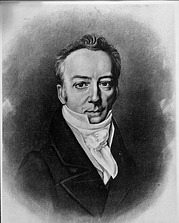 Congressmen, educators, researchers, social reformers, and the general public all voiced opinions as to what they believed Smithson had meant by “the increase and diffusion of knowledge." Initially most Americans assumed that Smithson intended to found a university, so the debates centered on what type of school. Gradually other ideas were introduced—an observatory, a scientific research institute, a national library, a publishing house, or a museum. 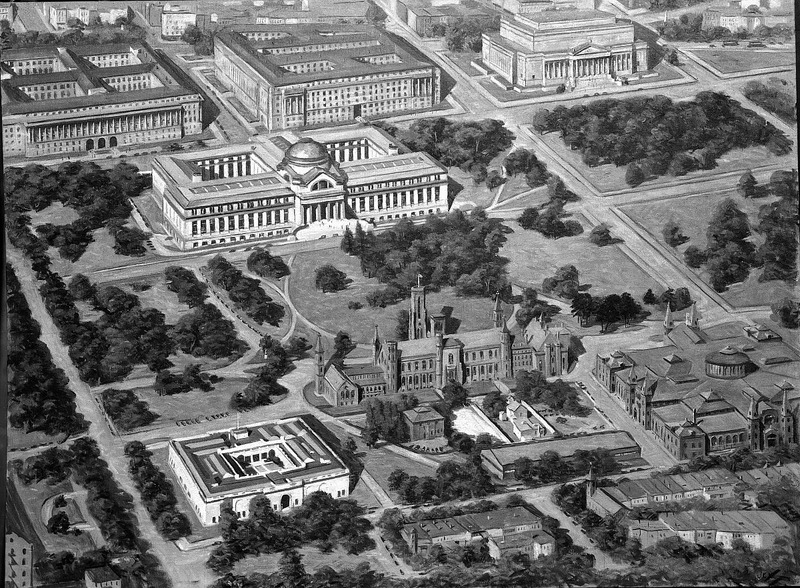 The Smithsonian’s enabling act was a compromise among these ideas, leaving out only the university. 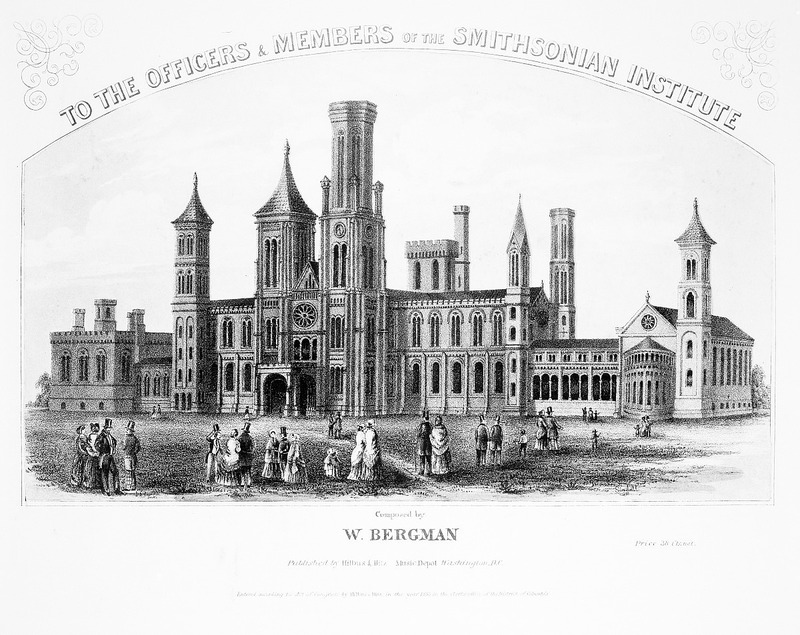 The Smithsonian Institution was created as a federal establishment, not part of the three branches of government, managed by a self-perpetuating Board of Regents. The Smithsonian Regents had to decide how to carry out Smithson's vague mandate and the broad legislation. Their first act was to build a home for the Institution, a Norman "Castle" designed by architect James Renwick, Jr., located on the National Mall in Washington, DC. The Secretary of the Smithsonian is its chief executive officer. There have been 13 secretaries who have led the Smithsonian since 1846.